The Unreached: Can God justly punish those who have never heard? One of the moral challenges to the Christian viewpoint entails the fate of those who have never heard the gospel, a.k.a ‘the unreached,’ and whether or not they are damned. Naturally, there are ‘biblical’ Christians on both sides of this non-essential, but important doctrine – some think that the Unreached will somehow be saved, while the majority view is that without Christ, they are lost. 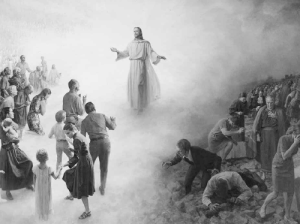 Isn’t it unfair that some people have had a chance to hear the gospel, and others have not? How we answer this question flows from our view of God, our view of what is loving AND just, and our soteriology. But for the sake of argument, if you believe that those who have never heard quite probably are going to face judgement and eternal punishment for their sins, how can you call God just? Isn’t it unfair that some people have had a chance to hear the gospel, and others have not? The real accusation is this – is it just for God’s mercy to be inequitably distributed – that is, some people hear of God’s mercy, and some do not. Is that fair? Below, I explore this theme, but I want to suggest a theodicy that defends the idea that God is just in condemning those who have never heard, and that they have in some sense received the gospel and some measure of mercy, based on one principle alone (though others may apply) – that of Generational Justice. The plight of the unreached taps into what I consider one of the two most significant challenges to Christianity – that of Predestination and Free Will (the other is the Problem of Evil). In my survey of the Bible, these are the only two conundrums in which, after giving some explanation, the Bible appeals to mystery – i.e. God challenges us by essentially telling us that we are too puny to get it. Since we are not omniscient, I would suspect that there ARE a few subjects that are only partially intelligible to us, and since the Bible really only makes this defense on these two subjects (unlike some Christians who use it as a lazy way out of a challenge), it is reasonable that perhaps God would make this move, but only AFTER giving some intelligible but incomplete justifications. What ends up happening in these cases is that the challenge breaks down into two pieces – the logical argument, and the evidential or emotional argument. The logical argument answers whether or not it is logically possible that such a condition, such as the existence of both predestination and free will, could exist. The evidential argument addresses whether or not the logical solution offered is probable, or philosphically, evidentially, and intuitively convincing. So I assume that any or all of the arguments below adequately address the logical challenge – that is, it is logically possible that God has just and adequate reasons for punishing all and everyone, including those who have not heard the gospel. However, many people do not find these probable or emotionally convincing. So I am now adding one more, and I think reasonable answer. Christian theologians and philosophers have attempted to address this moral challenge in many ways, but few address the evidential challenge and no one that I have found offers the one explanation that I believe may be most critical – that of Generational Justice. But let’s work through the other excuses, er, defenses first. Biblical theology, in general, would claim that all people are guilty, and if God punishes the Unreached, it is because, like everyone else, they are guilty of sins and merely getting the just penalty, nothing more, and nothing unjust. If some receive mercy and are not punished, that does not make the punishment of others unjust. And while this may be logically consistent and sound, it utterly fails to address the inequity of mercy given to only one of the two groups – and so it fails to address the evidential challenge. I mean, think of it – he must say that, for instance, most of the people in China or other unreached regions were more hardened to the gospel than those in the west. Is that believable? Not to me. Now while that is a possibility, I do not think it answers the geographical problem that such providential views face, as mentioned above. Are we to believe that if God had reached China (with arguably more people than any country in all time), that less people would be saved overall? In defense of this argument, Jesus has not yet returned, and it has been suggested that more people are alive today than if you summed up the population from all of human history – so if China, for example, continues it’s current rate of Christian conversion, it is possible that more people will end up being saved across history than under other circumstances. So this argument is not totally without merit. But I think there is better. There may be some biblical support for the idea that people will have a chance to hear the gospel AFTER they die and BEFORE their judgement, though such support is minuscule at best. Most of it is based on passages that describe Jesus’ descent into Hades during his burial (as per the doctrine captured in the Apostle’s creed), and perhaps preaching the gospel to the Old Testament saints in Hades/Sheol (the ‘holding tank’ for the dead awaiting the glorification of Christ – other passages used in this doctrine include Job 38:17, Psalm 68:18-22; Matthew 12:38-41; Acts 2:22-32; Romans 10:7; Ephesians 4:7-10, 1 Peter 3:18-20, and 1 Peter 4:6). As a side note, Dr. Walls is a protestant philosopher who also promotes the idea of Purgatory for the purpose of post-mortem sanctification (but not penal satisfaction or salvation), and has written an entire book on the subject. This view, in summary, might address the perceived injustice of damning the Unreached by God giving them a real chance, post-mortem, to hear and respond to the gospel. However, this theology is not well supported by scripture, and I want to suggest two more that ARE biblically supported. If you are a traditionalist regarding hell, you believe that God will punish the unsaved with an eternity of conscious torment. This in itself raises questions about God’s justice, since this seems quite disproportionate to a short life of sin, especially if done in ignorance of the saving message of the gospel. While this does affect our perception of the injustice of punishing the Unreached, I think it can be taken off the table in two ways. Firstly, if such a punishment *is* somehow proportionate (and I understand that many of us do not think it is), then the damned are merely getting what they deserve for their sins, and no more. They may not be receiving mercy, but mercy is not demanded by justice, and it is arguably not unjust to extend mercy to some, while withholding it from others, especially if those who do not receive mercy are impenitent. There is, in my view, a second reason why we can ignore the perceived injustice of eternal conscious torment – I am of the mind that the traditional view of hell is NOT biblical, and I now subscribe to Conditionalism (a.k.a. Annihilationism), which claims that the best exegesis of the relevant Bible passages is that after the unsaved die, they are punished in proportion to their sins, and then cease to exist – that is, they do not receive eternal life, and are therefore annihilated. You can read my many posts on this issue here, or at RethinkingHell.com, where I am a contributor. So to sum up, those who haven’t heard are not receiving punishment they do not deserve, but exactly what they DO deserve. This is just, even if some receive mercy. Those who do not receive mercy are not being unfairly treated, but justly so. Let me illustrate – if I reject the gospel, and am in some form of leadership, be it the head of my children, home, school, or society, I impact not just myself, but others – not just metaphorically or ‘spiritually,’ but actually! And while God may judge me more severely for influencing others away from the gospel (Matthew 18.6), the fact remains that I did affect them. Are they guilty? Yes, and not only due to their own sins, but perhaps also by the extension of my authority over them, as the one responsible for them. My claim is this – modern nations who are largely without a gospel witness are not so because their ancestors never heard the gospel – most DO have early first and econd century witnesses that they murdered or rejected, and in doing so, they brought God’s just judgment upon themselves AND their descendants. And so God is just in condemning the Unreached, based not only on their own sins, but on the sins of their forefathers. In the proxy of their own leaders, they DID receive the mercy of the opportunity to hear the gospel, but, just as all sinned in Adam, these sinned in their ancestors, who rejected God’s mercy for themselves and their descendants. Admittedly, this still does not bring the mercy of the gospel to the living person, so it incompletely answers the challenge. But it does explain in part that they received SOME mercy, though distant in time by at least one generation. What say ye? Jerry Walls, Hell: The Logic of Damnation (Notre Dame, IN: University of Notre Dame Press, 1992), 97. I read passages like Acts 1:8 about His disciples going … throughout the earth and Romans 10:17-18 from Paul’s assertion that “indeed ‘they’ have heard.” And, of course Romans 1:20 stating no one has an excuse to not know God. It has always been my understanding, though I may well never understand how, that God is capable of making His Word known throughout the earth. Thanks for commenting. While I share your hope or sort of blind faith that God can make himself known, the plain fact is that many people die without ever hearing the gospel. So we need to answer what happens to them. This is a good summary of popular views, Daniel. My own view is one that I’ve not heard espoused by anyone else. If you’re interested, I did a post about it on my blog a while back. “What If Someone Never Hears the Gospel?” on BeingFilled.com. I’m not sure we’ll ever get past concern for those who perish without hearing the Gospel. I understand Chuck’s perspective (and I have heard it before), but I do not share it. My focus in this issue is around general revelation. With all the evidence here on earth pointing to God, I have come to doubt those who loudly proclaim “I don’t believe God exists.” To get to that point, in my opinion, one would have to (as Chuck said in his blog) volitionally reject what the Bible says is plainly evident. Hey David, do you mind my asking where your view differs from mine? Based on what you have written here, I think we are actually in agreement. The Romans passage you cite only explains their guilt – but nature only alerts us to theism, and does not reveal the gospel. So if I respond favorably to the revelation of God’s existence in nature, but die without the gospel, how will that save or excuse me? Jeremiah 29:13, Matthew 7:7, Isaiah 55:6-7, and many other verses speak to seeking God and He rewards those who seek after Him. I am not diminishing Jesus’ admonishment to go and preach the Gospel and neither do I dispute the absolute requirement for a relationship with Christ for salvation. What I am wondering is if we (Christians) are a necessary prelude to the Holy Spirit drawing [everyone/anyone] to that relationship. I’m thinking back to something I first read in Steven McVey’s “Grace Rules,” to the effect of “what is it I think I have that God needs?” In other words, does God really need me (or us) to spread the Gospel before He can express His grace towards someone? I don’t mean to get into a prooftexting battle, but Romans 10:10-18 is pretty clear. So in answer to your question, YES, God needs us to spread the message or even the contrite will remain in darkness and damnation. I might have misunderstood your blog, Chuck, it had to be a quick read as I was trying to wrap up my e-mail before concluding my day. However, I thought I understood you to say everyone gets saved, regardless of whether or not they know Christ when they die: I took that from one of the opening parts where you were talking about Jesus (for lack of a better term … that you did not use) “universal” atonement. Ah, I see. I do believe in a universal atonement, but I do not believe that everyone will be saved. I see the rejection of Jesus Christ (and his atonement) as being the one unforgivable sin (compare Matthew 12:31 with Hebrews 10:29) for which men are sent to the lake of fire. I think #4 actually comes closest to the right answer. “Those who do not receive mercy are not being unfairly treated, but justly so” is about right. I would only use the word “equal” rather than “fair”, just because fair has some connotations that imply justice. Simply put, the sin we are responsible for is not the sin of denying, ignoring, or never hearing of the gospel. There is no reason why redemptive revelation would need to be general since those who have not received it end up with the just wages of sin. I think that a Christian would run into problems if they see scripture either as the revelation of moral law, metaphysical justification, or the epistemological foundation. It leaves sinners with an excuse that they could not have known better. I think Romans 1:20 and 2:14 are claiming that these philosophical foundations are known through general revelation of what has been made. Perhaps the children don’t inherit their father’s sin, but rather the continuation of their father’s sinful way of life. They inherit the tendency to choose sin because their parents have not taught them knowledge. It is great reading back over this discussion. As I did so, I was reminded of the parable of the vineyard owner (Matthew 20:1-16). Could it be an insight into God granting His mercy whithersoever He will? Isn’t Jesus describing God meting out His Grace and His Mercy maybe contrary to how our human minds might conceive of doing it but, nevertheless it IS His, to do with as He pleases. Which point, I think, deeds well into your (Daniel) point #4, above.